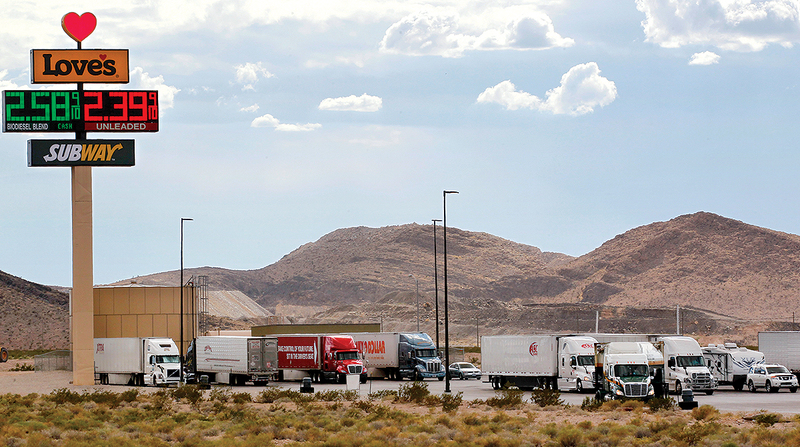 Some of the nation’s largest travel-stop companies are adding parking spaces and expanding operations in 2019, as national demand for truck parking continues to rise. Availability of parking has been the second-most important issue facing truck drivers for two years running, according to those polled in an annual survey of industry challenges conducted by the American Transportation Research Institute. According to ATRI Vice President Dan Murray, truck parking ranked fifth industrywide in last year’s survey. Natso — formerly the National Association of Truck Stop Operators — set a Feb. 8 deadline for responses to a member survey seeking information about nationwide availability of truck parking spaces, an effort to assist the Federal Highway Administration in a new round of assessments under Jason’s Law. That law, part of a transportation reauthorization package in 2012, seeks to study and address the shortage of long-term parking for trucks. The law is named for Jason Rivenburg, a truck driver killed in 2009 while parked at an abandoned gas station. He was attacked as he slept and robbed of $7. The latest survey is part of a second effort to quantify truck parking spaces in the nation. Helping 18 state governments compile the numbers is ATRI, which monitors almost 1 million trucks in real time, according to Murray. Getting the numbers right will be crucial because of the legislative timing. If the trucking industry and policymakers can divine how much parking is needed and where, it could be addressed in future federal legislation, perhaps within 2019. “We’re on the cusp, we hope, of a new infrastructure package,” said Murray. The demand is an opportunity for truck stop operators, even though most privately run companies do not charge for parking. Love’s Travel Stops plans to add 40 new locations and more than 3,500 parking spaces in 2019, according to a news release. The Oklahoma City-based company asked fleet customers about where to locate new stops, and was able to plan 40 new locations, according to Jon Archard, Love’s vice president of sales. He noted that it’s not always easy to plan a truck stop, despite the demand. “Sometimes the land is not always available, sometimes the price is prohibitive,” Archard told Transport Topics. Plus, zoning restrictions and congestion in cities can prevent Love’s from finding a site suitable for a location, Archard said. The typical Love’s stop is between 12 and 15 acres. In the past, Love’s needed less land, but as demand for tire repair and oil maintenance rose, the company began accommodating truck services, Archard said. Love’s plans to expand its on-site truck and tire care services and to grow its location count to more than 500 nationwide. As of Jan. 23, Love’s has 482 locations in 41 states, with more than 32,800 truck parking spaces, according to Love’s spokeswoman Tara Carr. Archard said Love’s is also studying whether it can expand the acreage of existing truck stops to add parking spaces. That type of “organic” growth is something TravelCenters of America is also doing, said Tom Liutkus, senior vice president of marketing for the Westlake, Ohio-based company. TravelCenters just added 82 parking spaces to its facility in Wheeler Ridge, Calif., south of Bakersfield, Liutkus told TT. Liutkus declined to say how many locations the company might open this year, citing its status as a publicly traded company. He noted that there are currently 250 TravelCenters locations with 47,000 parking spots in 43 states. The company has one Canadian stop as well. But since TravelCenters already has large stop-centers, expanding them to adjacent land has been difficult, said Liutkus. The company allows paid reservations for 13.7% of its parking spots, on average, Liutkus said. Pilot Flying J said the company will expand in 2019, according to a statement from company vice president Brian Ferguson. The Knoxville, Tenn.-based company said it will open more than 15 travel centers across the United States and Canada, with more than 900 new parking spots. The company will also seek more parking spaces from existing locations, with a goal of completing more than 10 facility enhancement projects, according to the statement. Ferguson said the company is also looking for ways to leverage technology, like its mobile application, to address the parking problem. The company’s website said it has 750 locations in 44 states, with 72,000 truck-parking spaces.